PREMIERE LEAGUE: Members of the 'Fortis' family at Wednesday's Musgrave ceremony at the IOJ; Above, gold awardees Morris and Ashbourne. WHAT happens when you combine the talents of one of Jamaica’s leading musical maestros with the genius of a literary stalwart? A project that’s potentially a classic in the making. 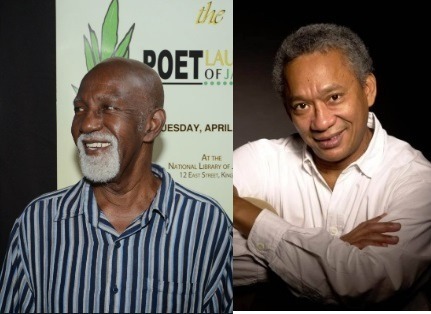 That’s precisely what Peter Ashbourne and Prof. Mervyn Morris are cooking up, having decided to merge their artistic gifts to craft a reggae opera based on the life and work of the late great Jamaican poet Mikey Smith. Ashbourne is composing the music. Morris is supplying the libretto and lyrics. “It’s been an enjoyable experience. We’ve been working on it for over a very long period. I would be doing lyrics and Peter would be working on the tunes. I’m new to writing song lyrics, so they helped me a lot,” Morris tells TALLAWAH at Wednesday’s 2018 Musgrave Medal Awards ceremony at the Institute of Jamaica, where both men were honoured. How did the collaboration come about? “Peter invited me to work with him on it because he knew that I knew Mikey, and that I had edited his work,” Morris reports. For his part, Ashbourne (whose wife Rosina Moder is also a contributor) felt Morris was the ideal collaborator. “When we came up with the idea, we knew he would be the right person to work on the libretto because he knows Mikey’s work very well,” says Ashbourne. According to the musician, no premiere date has been scheduled, but he’s hoping the finished product can be given a grand-opening fanfare sometime next year. Dr. Basil Burke was also made a member of the rarefied company of Musgrave gold medallists. 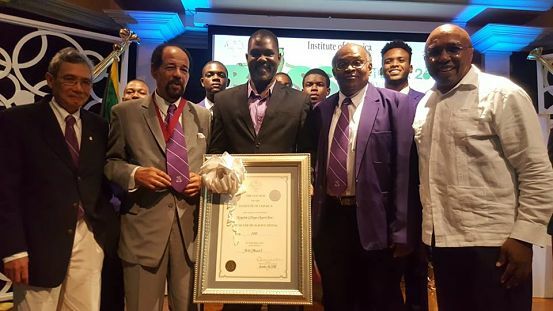 Silver medals were presented to pioneering dub poet Jean ‘Binta’ Breeze, the 71-year-old Kingston College Chapel Choir and scientist Dr. Henry Lowe, who was unavoidably absent. This year’s bronze recipients were contemporary novelist Roland Watson-Grant, bird-conservation expert Dr. Leo Douglas and legal luminary and art collector Prof. Oswald Harding, who was honoured for his vast and comprehensive collection. Entrepreneur and scholar Arthur Williams III received the Youth medal.